Harvest View is delighted to host lessons with upper-level eventer and Paralympics coach, Missy Ransehausen. Missy comes to HVS on a regular basis and offers lessons in both dressage and show jumping to riders of all skill levels. We also arrange for periodic cross-country schooling sessions. Lessons are $65/rider; $5 additional if using a lesson horse. Haul-in students are welcome. sport has been based on hard work & dedication. When you grow up in the shadow of a three-time Olympian, you work hard, develop your own style, and choose what you love the most.....Coaching & Eventing! Missy established herself as an outstanding rider early in her career. As a Young Rider, she brought home the Gold Medal from the 1988 Young Rider Championships, where she was also awarded the Good Sportsmanship Award. 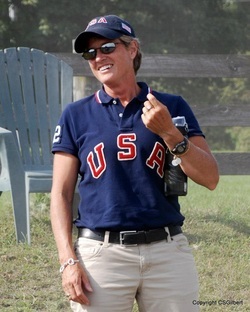 She received the Markham Trophy, USET's Highest placed Young Rider at Fair Hill CCI*** in 1989 and continued to focus on her riding career in 1995 as a member of the Three Day Event Team for the Pan American Games in Buenos Aires, Argentina. There the Team won the Silver Medal. Since then Missy has continued to build upon her own career and has developed a strong training program with a barn full of dedicated clients & students. Champion for Advanced Level 3 Day & 3rd Level Dressage. In addition to being a successful competitor, Missy excels in the training and coaching fields. Student after student can attest to her commitment to give back to the sport she loves. Just ask any member of the United States Paralympics Team! Missy has been the team’s devoted coach for the last three Olympics, even setting aside her own Beijing Olympic Team bid to honor her commitment to the Paralympics squad. Missy was selected as the coach for the 2000 Paralympics Team in Sydney and continues to serve as their dedicated coach. She coached the US Para Team to first place at the Pacific Rim Championships in 2006, and has served as Olympic coach in 2000, 2004, 2008 & 2012! Her student, Rebecca Hart , claimed the National Para Championships in Dressage in 2009 and took both Champion and Reserve honors in 2010 and 2012, and has been selected for the 2012 Olympic Team which traveled to London with Missy (continuing as coach) last August.